The main genetic material of the cell is DNA. In eukaryotic cells the DNA is complexed with proteins to form chromatin fibres. 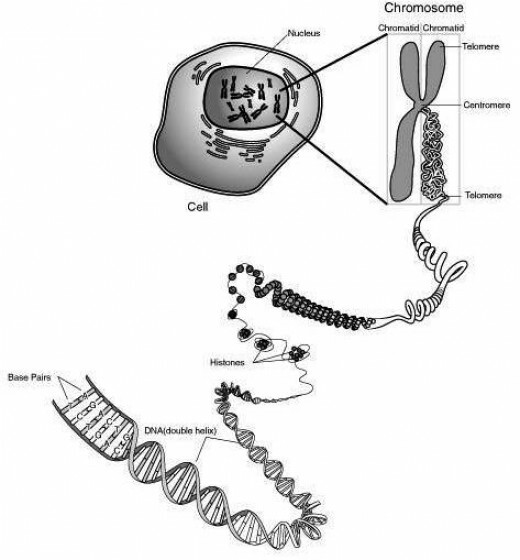 At the time of cell division the chromatin becomes condensed into chromosomes. The chromosome may contain a constriction site along the chromosome other than the primary constriction known as secondary constriction. Secondary constriction contain the gene coding for ribosomal RNA and that induce the formation of nucleoli. 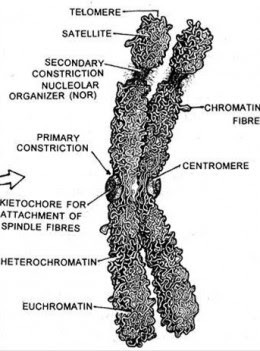 Satellites are round bodies separated from the rest of the chromosome by a secondary constriction. The chromosome with the satellite are designated as sat chromosomes. The tip of chromosome is called telomere. Telomeres promote chromosomal stability. They contain the ends of the DNA molecule contained in the chromatid. Euchromatin: Some part of chromosomes take less stain and appear lighter in colour. These areas are called 'euchromatin'. Heterochromatin: When chromosomes are stained with acetocarmine or acetoorcein, some parts take more stain and appear darker. These areas are called 'heterochromatin'.